We sat beneath the tamarind tree, the goat-herd and I. I had been walking along the track when I came across him tending to his goats. He was thin as a stick, like most villagers in the valley. His knobbly knees were like cricket balls beneath his worn dhoti, pulled up and tied between his legs in the traditional manner. I stopped to allow his goats to cross the path, perhaps half-a-dozen of them: bleating, looking almost as emaciated as the owner. The goat-herd was neither old nor young, of average height, with an angular face and a rough stubble. But when my eyes met his, they seemed to have a knowing twinkle. He turned his head and gazed long and hard at the hills to which I had pointed. 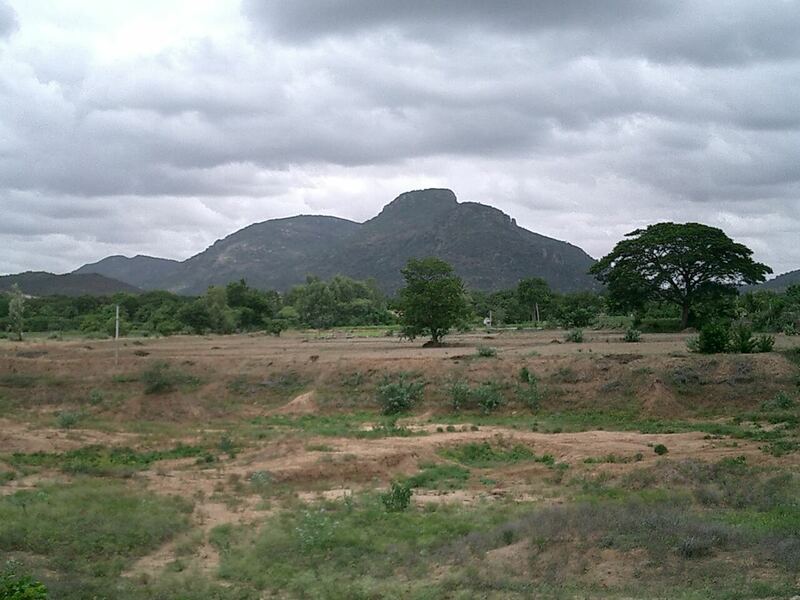 There they stood, dominating the horizon: the magnificent triad of Rishi Konda, Centre Peak and Bodi Konda. Each distinct, as old as time itself. The sun was half-sunk behind them, an orange ball of flame lighting up the land with a russet glow. I looked at him incredulously. The sky was glass-clear. Not a breath of cloud in sight. The monsoon had passed and the valley hadn’t seen so much as a drop for many months. He took me to the shade of the old tamarind and made me squat with him, facing west. He pulled out something from a cloth packet and held it out to me. Two ragi balls. He nodded at them. Take one he said. And watch the hills. I nibbled the ragi. We were in that moment when day meets dusk and the land stills with a peace that is as old as the hills. The sky was burnished grey—and clear as slate.There was no way it was going to rain. No way. And then I saw it. A tongue of dark purple pushing over the top of Bodi. I watched, mesmerized, as it emerged. Soon I saw it entire: a single, pregnant, tightly wound ball of cloud. I threw a quick glance at my companion. He was also watching it with a still intensity. I looked back up at the sky and was shocked. The grey balled mass was already much closer, racing towards us, growing bigger by the minute. Suddenly, my heartbeat was up, my mouth dry. Yes, I said, yes. I’ll race it. I moved off onto the path and half-crouched there in the manner of an Olympic runner; Gopal stood beneath the tree, leaning on his stick. I kept my eyes on him. All was utterly still. My heart was going like a trip hammer. Then I felt it: a rush of cool air, a moving draft coming up from behind, whipping up the sand; and with it came up that heady perfume of earth about to be touched by rain. I took off, legs and arms pumping. I accelerated round the curve. I put everything I had into it. The air current was stronger now, pushing against my back, and all around was a hissing and roaring, as if the very elements were a crowd, watching the race. Then my foot snagged a stone; I tripped and fell. Before I knew it, I was flung forward and hit the ground. The breath whooshed out of my lungs and I lay there, heaving, facing the other way. Before me was a sight from another world. The cloud was above me; hanging down from it was a narrow – perhaps forty-foot – curtain, bridging earth and sky: a red coruscating wall set afire by the rays of the setting sun. It sped towards me with blinding speed…thirty feet…twenty…ten…and then it hit me. In an instant, I was cocooned in another world. Water everywhere, a hissing spray stinging my skin, drenching me in seconds. And then it was gone, racing away eastward through the valley, lashing the ground in its wake. I lay there for a while: all thought and feeling suspended by the intensity of the moment. Then I raised myself and hobbled back the way I had come. Gopal was not there. I cast about feverishly, called his name aloud. Nothing. He and his goats had vanished. I never saw him again. That was sometime in 1976 or ’77, I think. When I was sixteen or seventeen. Thirty-six years have passed, but he stays with me still, fresh and alive as if it was yesterday: the man called Gopal who had a cloud for his friend.